France produces some amazing art. It might be very hopeless, loveless and obsession driven, but it is still pretty amazing. Once upon a time, the art that was being produced in France was entirely Christian. Yeah, that’s right. All of the art coming out of France was Christian. You have to go back several centuries, but this was indeed the case. What if good Christian art, spoken, drawn, painted, acted out, or even filmed, became once again a significant part of the French art scene? That would be incredible for God’s renown in this hyper post-Christian country. Do you like good art? Do you make good art? Do you dance or paint or act or create? Can you do that while adoring Jesus and proclaiming him? Can you do it well? There is a huge opportunity for you in the Paris Hub! 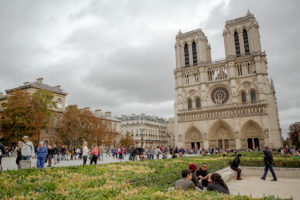 You could come to Paris and learn French language and culture while becoming familiar with both the secular and Christian art and performance art scenes. (There is a lot to become familiar with.) During this time you could also start to produce some of your own stuff, even on a small scale. Once you are properly acclimated, recognized and networked, you can start to create and produce good art, using it to build God’s church, further God’s renown and engage French people and culture. There are many ways to go about this and it really depends on what kind of art we are talking about. This opportunity is for someone who is able to use their creative skills and life to lift Jesus up and build his church. We require you to be experienced and good at the creative arts. We require you to be patient. It takes some time to learn how to communicate and express yourself well in French. Patience goes a long way.